Relay For Life teams camp out overnight and take turns walking or running around a track or path at a local high school, park, or fairground. Events are up to 24 hours long, and because cancer never sleeps, each team is asked to have at least one participant on the track at all times. The event begins with an opening ceremony, after which survivors walk the “survivor lap”, celebrating their victory over cancer. Following, are the caregiver and opening laps. Candles are lit during the Luminaria Ceremony, honoring those who have passed away or are still fighting. Rounding out the event will be the Fight Back Ceremony. “Originally, one gentlemen, a doctor, decided to run for 24 hours to raise money for his cancer patients,” explained Wilson. Games, food and entertainment will be provided to participants throughout the event. 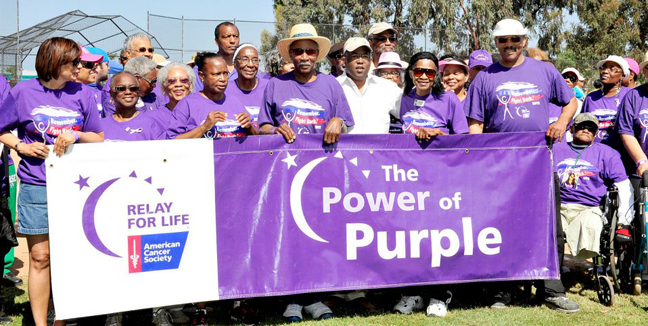 For more information visit www.RelayFor Life.org/BaldwinHillsCA, or call (323) 353-6635 or (213) 407-1640.